Please note before I begin this post that I am aware that PECS is a specific and trademarked system. I have been through the formal training, however, like most, I have adapted it and can no longer officially call it PECS. Over the years, I’ve had a love/hate relationship with picture exchange. I have gone through years when I’ve created picture exchange books for every life skills student. I have had years where only my speech materials were in a picture exchange book. I like using them to request a specific item as a “choice” after completing a token board. I like using them for snack time. I hate using them for circle time, social conversations, or during non-requesting therapy. Plus, they are a pain to make. I hate photos or using Boardmaker to make specific images for specific kiddos, then laminating, adding Velcro, having the student lose/throw/eat the icon and then needing to start over again. If you love this make/re-make process then more power to you. Not me, no thank you. My friend/co-worker, however, has really challenged my thinking on picture exchange. She has asked some tough questions and helped me to again see the value in the system. 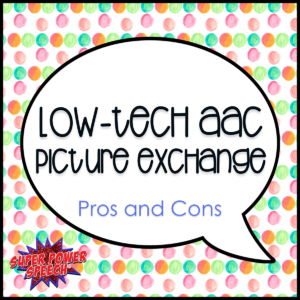 Below are some of the pros and cons that I’ve determined for the use of picture exchange as a form of low-tech AAC. Increases communicative intent: Picture exchange was built upon giving kids a compelling reason to communicate – to get something they want! Facilitates expressive communication: It helps communicators to initiate and seek out their communication partner, rather than waiting to respond. In Phase 2, the communicator is taught to choose their picture then walk across the room to request. This is not a modeling system. It is active and expressive. Quick to learn: Overall, PECS is quick for staff to learn. Through the formal 2-day training or informal in-services, most adult staff and family can understand the basics of the system very quickly. Many students also quickly master Phase 1 of the training. It is exciting to see quick short-term progress. Difficult to use beyond requesting: It is not until Phase 6 of the training, a phase that my students are rarely able to get to, that commenting is introduced. If the communicator gets stuck at an earlier phase, they will be only able to request with picture exchange. Limited vocabulary: Even with a personalized communication book, there are rarely more than 50 vocabulary words from which to express. Limited grammar: Because PECS relies on requesting, there is little emphasis to learn adjectives, pronouns, or basic concepts. Limited complexity: From my experience, picture exchange cannot help with communication of more complex ideas. As a follow up to this post, an AAC expert has put together her research and experience-based thoughts about using PECS and core vocabulary with a student who has Autism. That post will be published within the next few weeks. Have you used picture or symbol exchange? What do you think? What additional pros and cons would you include on the lists?